The Enterprise version of the Intoweb HR system provides a complete end to end solution for all large companies HR needs, with very large staff complements, many branches, and even international presences. A SaaS cost effective simple HR system for small businesses. How do Intowebs Human Resource Modules help you? Intowebs convenient HR modules makes daily handling your your staff much simpler, by automating and streamlining all your day to day HR tasks. 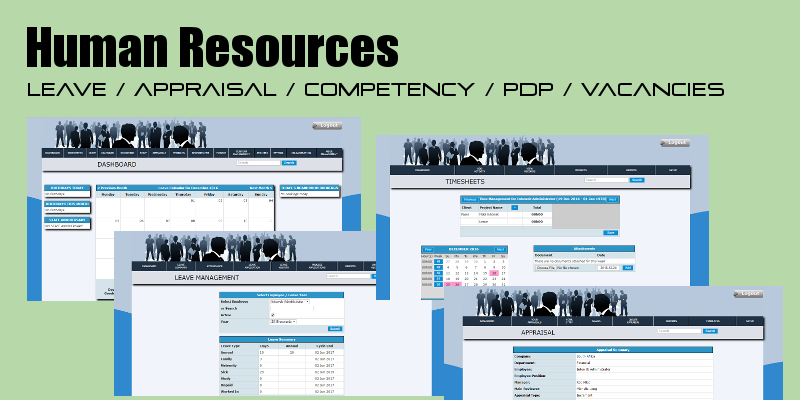 You do not have to buy the whole HR suite, you can purchase various stand-alone modules that will suit your daily needs. Why is Intowebs Human Resource Software different? - Our Human Resource systems run online, meaning you can access all your information anywhere, anytime around the world, at the tip of your fingers. All you need is the much-available internet. Our system will work perfectly on your intranet. Running smoothly and safely. -No overspending with us - you will not pay the full suite, if not necessary you will choose only those modules, that seem to benefit and accomodate you. -Like to build your own stuff? All our HR systems are completely customizable and integrate and blend perfectly with your current systems. -We have the most skilled programmers around - we are more than apt to build you an HR system, that you need that we don’t have. -We’ve got everything you need - from hiring new staff to disciplining our HR modules have got all your Employee Management needs covered. We are enthusiastic about creating Human Resource systems. We are always adding to, or working on our current HR modules. Below is a list of modules we have. If you do not see a module that is to your liking please contact us for a free evaluation to build you a completely customizable system. To read more about each module, click on the headings below. Want to find the perfect candidate? Our recruitment systems contains various features that will assist you in finding your perfect employee. Introduce your employees to company culture and what is expected of them. Intoweb Induction software makes this a breeze. The induction system also tracks the usage of each new employee, so you can effectively see what course materials they have completed? Want to know how your employees are spending their time? The Time and Attendance module keeps track of the activities and attendance of your employees. The system allows you to observe time, projected on a project and the time taken to complete a project.. As well as various other reporting systems. The Intoweb Vehicle Management system makes fleet management and maintenance, possible by keeping a record of all the vehicles within a company, and their registration numbers, make and model. Making projects easier has never been this simple. Efficiently plan, organise, manage and execute your projects and resources, from one place and keep a hawk’s eye on your project’s status and all your resources. Managing a project means managing the tasks within them. The task Management System gives you the power to track tasks online, making planning and managing tasks more efficient. Assess your employees with our Appraisal Module. Add notes during the period which you appraise your employees, and have both employee and manager complete a pre-appraisal assessment before your appraisal meeting. The Intoweb Appraisal system also allows you to record information gathered within the appraisal meeting. Monitor your employees performance by setting them KPI’s which are easily measured. Develop your employees by registering and developing Skill Development plans, and recover SDL tax. Make learning easy, with the Learner Management system. Streamline the presentation of courses. Plug the Contacts module into your intranet as the ideal piece of software to store all your contacts centrally. Organization is key to an organization. That’s why, we’ve created the resource Booking system for you. Once place, where you can track all the resources in your company ie boardrooms, projectors or even people. Any employee, can easily log in and see, when a resource is booked out, keeping fuss to a minimum. It is a nifty piece of software to manage the availability of people, you can set an appointment to private, showing the person not available and hiding the details of the appointment. Straighten out your communication with the Online chat system. Pertinent information can easily become lost, in flows of physical communication and emails. The Online Chat system will open the streams of communication, between you and your employees, and your employees and each other. The HR Manager is in charge of various responsibilities such as ensuring the wellbeing of employees, recruiting, firing, disciplinary, leave and of course paying them. Are there too many employees to pay? Intoweb's Payroll Module can help you keep records, integrate with banks and provides PAYE, etc.